I haven't accomplished many of the things that most people have. 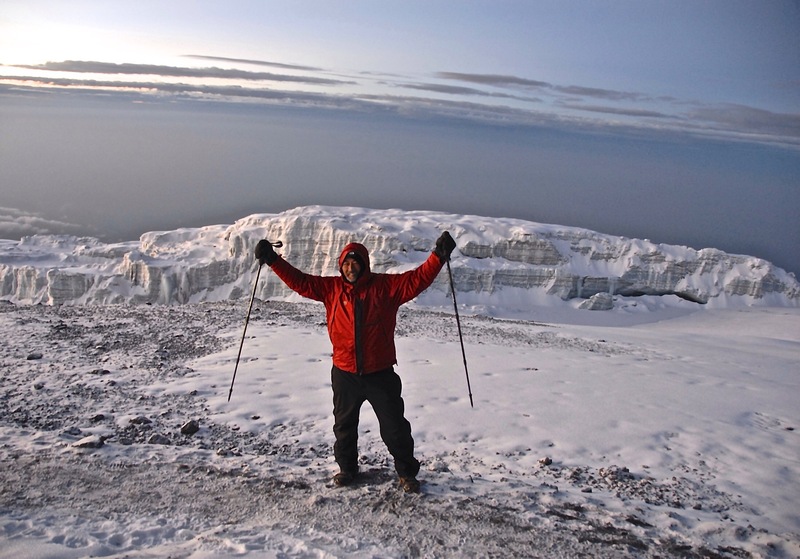 I have climbed a lot of mountains, including Mount Kilimanjaro. I am a father, grandfather, husband. I work for one of the best organizations in the world-Compassion International and I have the privilege to travel all over the world witnessing people's lives being meaningfully impacted. Her day started like any other day had started in the past thirty years or so. It was time to start her chores, gather some firewood for cooking, head down to the local well and bring a few buckets of cold water to the house. Naomi lives in the Highlands of Otavalo, a mountain community in Ecuador. A remote area of lush farmland, with small patches of crops scattered on every hillside, resembling a magnificent quilt of every shade of green. She lives with her older siblings and her nieces and nephews. She has children of her own now, a boy and a girl. The family is close, they always have been. I suspect they always will be. Today as Naomi prepared to walk the three miles to the Student Center, there was a slight spring in her step, a little excitement. She had made this walk nearly every day for over thirty years now. She remembered feeling this way a few times before on her way to the church that was her second home. She remembered how her little brother would come home and tell her about all of the wonderful things they experienced at the Student Center. How the older women taught them about Jesus and how they loved all of the kids. How there were fried plantains and sweets some days, and always rice and beans and every now and then a piece of chicken or a hunk of beef. And games that seemed to last all day, but best of all, once every so often they would load up onto buses and go to the big city far away. In those early days, the children at the project would travel to Quito, the capital of Ecuador. Her brother would come home and tell her of the wonderful things he saw and experienced. She could not imagine such a place. As hard as she tried, she could not picture in her mind the tall buildings and the cathedrals, the cars and buses and the bustling people. She longed to see these things for herself. Her greatest desire in the world now was to become a sponsored child. The desire was so strong that she would walk with her brother every day that the Student Center was open. Even though she was not officially registered, Naomi became a fixture there. The tutors would invite her to come in and join the other children. She would receive a snack or a hot meal on most days. She would have the opportunity to be with her little brother and play with other children from the community. But the reason that Naomi really came, was to hear about Jesus. She wanted to know more about this man that loved the world so much. She wanted to know more about God and how these teachers could love her the way they did. It was the one place in her entire world where she experienced true love. She knew her parents and siblings loved her, but her parents were seldom home. They worked the fields and the greenhouses from dawn until dusk to provide for the family. Things were very different at the Student Center. There were adults here throughout the day, teaching and caring for the children. She was not required to clean and cook and care for her younger siblings. She was simply allowed to be a little girl. She also didn’t feel peculiar around the other children. No one ridiculed her because she couldn’t run or walk very fast. No one seemed to notice her limp here. They just accepted her. As the weeks turned into months and the months turned into years, Naomi began to wish for only one thing, that she could join the program at the Compassion Student Center. She began to pray to Jesus that she could really belong there. That she could be registered and that she could have a sponsor. Her little brother belonged to the project but they did not have room for her. And now her little sister was a part of the program and still there was not room for her. She often wondered to herself why she could not belong. She assumed it was because she was not physically well enough. So she tried harder to fit in and to keep up with the other kids. She ignored the searing pain in her legs in order to fit in. She knew that she could do all the things that the other kids could do. And if she could ignore the pain long enough maybe they would let her be a part of this wonderful place, maybe she could have a sponsor of her very own. The tutors at the Compassion Project loved Naomi. They made her a “special guest” of the church. If the project could not accept her as a sponsored child because of rules and restrictions and lack of quotas, then the church would allow her to come as often as she desired. They saw something special in Naomi, how hard she worked and how much she loved being there. They also saw that she had a limp and that she was covering up the pain in her legs. Naomi’s wish to see the big city was finally being realized. She was filled with excitement to see for the first time the things her brother had tried to describe to her so long ago. She was amazed at the sounds, and the sight of so many people. She was thrilled to ride in a truck for the first time. She was also filled with a sense of dread. Naomi was being taken to Quito to see a doctor. She was diagnosed with a bone disease. Her legs would never be as strong as they needed to be. She would never be able to keep up with the other children. Treatment was necessary, therapy sessions were needed. But medical care was not in the cards for this little girl from a rural mountain community. How could her family afford this? 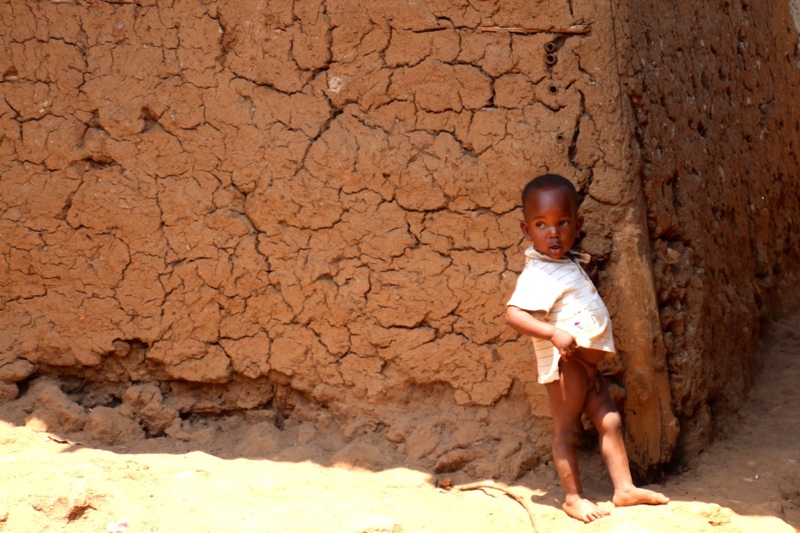 The disease in her bones continued to attack her until she was no longer able to go to school. Naomi dropped out of secondary school, any thoughts of getting an education; to learn simple arithmetic, or to read and write had now become a distant dream. The one dream that she still clung to was to become a Compassion child and to have a sponsor one day. And the reality that she held on to, was knowing this –“that as long as one child could eat, the others could eat as well.” And so she continued to visit the project as often as possible. She continued to make the long walk on legs with brittle bones. This was all she had now. The project had become her second home, school was not an option. 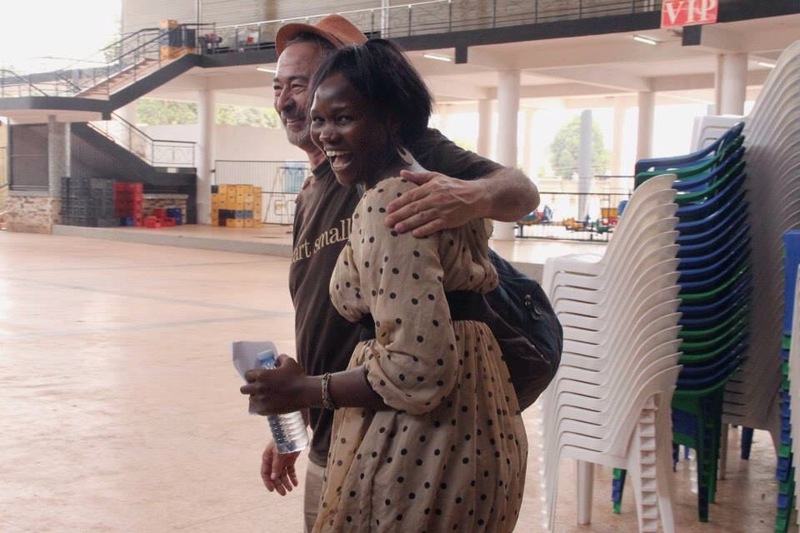 So Naomi came every chance she had and soon she was learning mathematics at the project. She was learning simple math and she was learning how to read and to write. And she came week after week, always praying to really belong and to have a sponsor of her own. And then that day arrived. She became registered at the center and not long after that happy day she received a sponsor. A wonderful couple from the United Kingdom named Roger and Helen. Not just any sponsors, but sponsors that wrote to her every month. Sponsors that encouraged her and asked her about the weather. Naomi had no concept of Spring or Fall, her only experience being rain and cold or warm and sunny. She only knew two seasons, the rainy one and the dry one. Roger and Helen sent her postcards of the places they had traveled. She began to understand the seasons and snow and what beaches were. And those postcards and letters caused her to dream, to imagine other places. To think beyond her remote mountain community and to realize there was a great big world out there for her to discover. Roger even visited Quito on business and she felt the world get just a little smaller for her. Her sponsor was in Ecuador, he was in Quito and she could imagine where he was. He could imagine where she was. She longed to see him but was content in the knowledge that they had been to the same place. Nine years the letters and postcards came to her, one letter every month. Naomi kept every letter, for every letter told her to keep joy in her heart, to be happy. Every letter told her how she could do more, be more. And she believed this beautiful couple from another place, a place so far away from her that it might as well have been in another universe. Only this universe held two dear people that loved her very much. And Naomi kept believing in herself, she kept learning whatever she could from the tutors. Then one day she received the news that Helen had passed away. It was devastating news to Naomi. Fortunately, Roger continued to write to her. Like clockwork, the letters continued to come, month after month. Still asking her about the weather and had she ever been to the beach. Still telling her to be happy and to have joy in her life. And Naomi loved her sponsor more than ever, she longed to meet him one day, to hug his neck. Finally Roger’s last letter made it to her. A photo was attached of Roger sitting in a wheelchair, this once vibrant world traveler bound to a chair in a hospital room. He had to tell Naomi goodbye, this would be the last time he would be able to write. He was very sick and could no longer sponsor her. I don’t know what happened in the hearts of the sponsors that day when they heard this story. Some cried, some may have hurt a little, some may not have noticed Naomi at all. I can only tell you what happened in my heart that day. An audible sigh filled the room at that point and I saw tissues dabbing eyes throughout the group. Naomi is now a woman of 37 with a family of her own. She completed the Compassion program 18 years ago. She has never left the place that she called home. The only reason we met her was because she came upstairs to the classroom where we were having lunch so she could say hello to the sponsors that had come from so far away. We invited her to sit down and enjoy the wonderful meal we were having. She seemed so pleased when we told her how good the food was. It was her hands that had so lovingly prepared the meal for us. It was her hands that had given back to the little church that loved her so long ago. She had been preparing meals for the children at this center for the past 18 years. Giving back to the people that had given so much to her. The past thirty years she has been a part of this church, as a child with so many needs and so many unfulfilled dreams. And now as an adult, giving and loving and serving. Naomi finished High School two years ago. This is where the story should end. This is where it ended for everyone else that day. A round of cheers went up from the group to celebrate her achievement and sponsors got up to give her words of encouragement, and hugs and kisses. And then everyone began to leave the room for the next thing on our agenda. But I didn’t leave just then, I couldn’t leave just then. The storyteller in me needed more. I had some questions for Naomi, needed a few more details. As everyone else kept moving, I had to stay behind to find the meaning in the story. I grabbed Nico, one of our translators and asked if he could translate for me. I told Naomi that her story was powerful and asked her if I could have permission to write it. She said yes. I then asked about Roger and whether he had passed away. She said he had. What happened next was simply from God. I crouched down beside Naomi and asked Nico to tell her that I felt like I was supposed to give her a hug. Would she be ok with that? She said she would. As I hugged her, strong emotion welled up from some deep place in my soul. I recognized that emotion. It is something that doesn’t happen often but when it does I’m absolutely certain of its origin. I told Nico to tell Naomi that God wanted to give her a hug. And we embraced for a few moments. And then I heard God say that this hug was from Roger and from Him. I asked Nico to tell her that this hug was from Roger too and I was barely able to get the words out. Nico spoke the words to her as he held back tears of his own. The embrace was strong, the tears streamed to my neck and the sobbing came from deep within. Her tears mingled with mine. Or maybe her tears mingled with Rogers. I’m certain they mingled with Gods. I don’t even know how many seconds or how many minutes went by as we simply hugged each other and cried. The embrace was vigorous and firm. When I had the courage to finally let go of her she said something to me in Spanish that I will never forget. Nico translated as well as he could as he choked on the words. At that moment, I knew that both of us had slipped right into the arms of Christ. These few short moments in a week-long trip completely undid me. And I stand grateful that I could be the vessel that heard God say; to give someone unknown to me, a simple hug that changed both of us forever. Seven years worth of letters. Seven years of writing to her child, telling her about her life and mentioning so many things of little consequence. Asking her about her likes, her favorite subjects in school, her favorite sport or her favorite foods. Getting letters back in return, asking her what her favorite color was, what her home was like, did she plant corn or did she plant anything. The letters went back and forth for seven years. Some years there were more letters than others. Some years the communication was tangible. The letters made sense, there seemed to be a lot to talk about. Some years not so much. At times they seemed distant to one another. As if they really didn’t know one another. The questions seemed so generic. How many times are you going to ask me the same question? How many times do I have to ask the same question before I get an answer? And yet she still wrote to her girl, little Dhanya. And Dhanya faithfully wrote back. For seven years. As time went on the letters took on a deeper significance. They were impactful. They were meaningful. She realized that somehow as time moved on, her letters were making a difference in Dhanya’s life. Somehow this little girl was gaining sight of what she was intended to be. There was purpose, there was an end in sight that looked hopeful. So the letters continued. Another year gone by. Now the letters were words of encouragement. Tell me of your dreams. Tell me what you hope to become someday. And Dhanya’s letters gave her hope too. Dhanya wanted her sponsor to know how important she was to her. How much she loved her. How she was excited to receive her letters. How she saved them all in a special place in her home. How one year the rains came and threatened to sweep everything away. How the water rushed in to her tiny home and destroyed everything they owned. How she risked her very life to get back into the house and retrieve the only thing that mattered to her, her letters. The letters that made her smile when she had nothing to smile about. The letters that brought her hope when all was hopeless. The letters that she would read again and again, especially now that the rains had taken everything. Almost everything. The rains could not take away her hope, her joy. She had to save them. They had saved her. And so many times this sponsor had thought she might have to quit writing, she might have to quit sponsoring. In those seven years she had grown too. She was no longer a young schoolgirl with bright dreams of her own. She was now a mother of two with rent to pay and work to be done. So much work. Diapers to change, and baths to be given. Get dinner on the table, her husband would be home soon. Pay the bills, did she forget to pay the utility bill? Oh no, is the electricity about to be shut off? The kids need new shoes and the doctor bills are mounting. There just isn’t enough money at the end of the month. Maybe it’s time to reconsider this long distance relationship. What difference am I really making? How much difference could I really make to a little girl in a faraway place like India? She asked these questions almost every night as she tucked her own little girls into bed. And when everyone would go to sleep and the distractions of the day would turn in for the night too; she would pray. God am I really making a difference in Dhanya’s life? Does the $38 I send every month really help to supply some of her needs? And as she talked to God in her quiet time she would feel compelled to write Dhanya another letter. She would go to the box that she stored all of Dhanya’s letters in. She would pull them out and begin to read them again. Some of them felt like it was the first time she had read them. As if they had just come in the mail that day. Some of them felt like old friends. So comforting and so familiar. And the thing she held onto as she read each letter was just how beloved she knew she was by Dhanya. She saw the words that she had seen a hundred times. The words that Dhanya always used in every letter. She saw that Dhanya had become her beloved too. Every letter for seven years had always ended – To my beloved, “with a thousand kisses”. Love Dhanya. And she realized that she had started every letter to this little girl – My beloved Dhanya. How could she even think to stop? How could she leave her beloved? And so she held on to those words… with a thousand kisses. They became a promise. They became a beacon. And now she knew what she must do. Whatever it took, she would save and she would work harder. She knew that she would have to visit Dhanya. She had to see with her own eyes what her love had produced. She already knew what Dhanya’s love had produced in her. So she made sacrifices. She took on ways to earn a little extra money. She made a commitment in her heart to see and hold Dhanya. And that dream came true for her and the little Indian girl named Dhanya. And I suppose if anyone was actually counting, there were more than a thousand kisses given to each other on that day. Maybe a thousand and one. “A little ragged around the edges” – has been my response to friends and family when asked how I’m doing after my trip to India. Of course I tell them how amazing India is and how warm and kind the people are. I always mention the colors and usually tell them how one of the sponsors described it as “a rainbow exploded and poured color on everyone”. I could never say it very loud or I would risk not getting anything to eat that night. So I would take lots of white rice and a very small helping of curried vegetables. And after dinner was over and the dishes were done I would sneak back to the kitchen and make a PBJ. That or a few Little Debbie oatmeal pies. It wasn’t just the curry that I didn’t care for. Indian food is especially spicy. I’m talking the hot spicy. I know, I know, I’m going to hear it from all my cuisine-loving, spice is the slice of life friends out there. And believe me when I tell you that I love spicy food. I try new things all the time and I can put away some good Mexican food. I’ve even eaten guinea pig in Ecuador for Pete’s sake! But when the food is actually setting your mouth on fire and your eyes are watering so hard that you have to fear getting dehydrated; then my friends I think we have crossed the line. Several of them. Suffice it to say that I am not a big fan of Indian food. I survived on steamed white rice and bread for ten days. And I couldn’t even sneak off to the kitchen to make myself a PBJ! The other thing that I will always mention when talking about India is the traffic. There were never really any traffic jams. The traffic was always continually moving. Moving at the pace of every man for himself. Pedestrian traffic was the same way. Every man for himself. I never sensed that anyone was being rude, they just didn’t stop if you stopped. If you hesitated in a crowd for just a second, several people would just blow right past you. The street traffic was the same way. Hesitate, and a sea of motorcyles and auto rickshaws would go flying by. Traffic just kept moving all the time. An “auto” short for auto rickshaw. Rickshaws used to be pulled by people on bicycles or horses. And the sounds. You cannot describe what any city in India is like without mentioning the noise. It was a constant barrage of horns and engines. The sounds of India were like the colors. Brilliant and loud. Bright and beautiful. Like an orchestra that was forever warming up and you could anticipate the music that was about to come. And at times, it was like music to me. Once I stepped into the rhythm of India. Part of that rhythm was a wonderful gesture that people of all ages used. The only way I can describe it, is a bobble of the head. A movement very similar to those bobble head dolls that people keep on their dashboards or the bobble heads of athletes that you can find at any sporting event in North America. If you said thank you, you would likely get a bobble of the head in response. If you asked a question or asked for directions you may simply get a wobble of the head. It means many things in their language, it could mean yes, it could mean no. It could mean I’m thinking about it or I’m not sure. It could mean maybe or it could mean “as you wish.” In a country of over 1,650 dialects it appeared to be a universal response that everyone understands. I find myself doing it on occassion now. I do it when I don’t really want to answer a question. So my response after being home for nearly two weeks is still “a little ragged around the edges” or a simple bobble of the head. I’m not ragged from the noise and the smells and the spice. I’m a little ragged from the drain on my emotions. There are stories that don’t often get told when people ask me about India. I give them the quick rundown of traffic and people . So much traffic, so many people – over 1.27 billion of them! I tell them that I managed to not get sick, which they always seem to ask about. How I’m not a fan of curried anything. But I never seem to be able to get around to telling them the stories that really matter. So I thank you for staying with me this far. I need to tell you why I’m a little ragged around the edges. And I’m not even certain that I know completely how undone I am. This may require more than one story. Our group of thirty Americans and four India staff had just moved from spending four full days in Chennai. The city is on the coast in the very southern part of India. I would describe Chennai as a very modern and progressive area. We had very little to be concerned about regarding our faith and our nationalities. But now we had moved on to Nagpur, in the very center of India. There isn’t much to see in Nagpur. This was evident when I was asked by a traveler on the plane to Nagpur what we were doing there. I responded that we were doing some sightseeing, that we were tourists. This is what I have been trained to say when visiting other countries. His response threw me off a little – “What is there to see in Nagpur?” Good question. No good answer. So while in Nagpur we were told to keep a low profile. To not broadcast why we were there. Members of a political faction that are in power were staying at our hotel. This group wants to eradicate Christianity from India. I only mention this to help you understand the climate that we were in now. So we went to visit a little church in the city. A beautiful place run by beautiful people. We spent the morning with them, learning about their programs, watching children perform cultural dances and playing with the kids. After lunch we were to split into six groups of five and visit some of the homes in the area. I knew from speaking with the Pastor that everyone was a little nervous about thirty Americans walking around the area and visiting people’s homes. I cancelled the home visits much to the relief of the Pastor and his staff. We decided to have the families come to the church instead. This is when I met her, the girl named Mahime (Ma-hee-may). I had noticed her earlier in the day as she performed a cultural dance. We had spent a little time getting to know her parents and learning about some of their struggles. But when Mahime showed up she captivated all of us immediately. There was something about her eyes. She had the eyes of an old soul. I’m not even sure what that means but that’s the only way I can describe it. She explained that the house she was living in was owned by a Hindu family and they were not allowed to pray or worship out loud. She explained how she did pray and worship and praise. How she could not stop praying and praising. She did it quietly. She did it in secret. Her and her parents had learned how to commune with God in a quiet way, in a secret place. Our hearts were captured by this little girl named Mahime, wearing a red saree and possessing a heart that wants to please the Lord. A girl who was a miracle to her mom and dad. A child that was never supposed to be conceived. A child that the doctors had told the parents would never be. A child that was an answer to a mother’s prayers. A child that touched us with her simple wants, to simply praise Jesus. And as I mentioned earlier that India is a country of so many dialects, it is important to know that in the particular dialect of Mahime and her family, which is Tamil – Mahime means Praise. And I am sure she is praising Him now, with every breath she breathes, and with every move of every dance. And when her eyes look into the heavens, I am sure that God looks back and is pleased with her soul. I pray that this beautiful little ten year old girl will soon have a place that she can worship and praise from the top of her lungs. That she could shout His name from the rooftops! And if you knew the little girl in the red saree named Mahime, the way I know her; then you know that she is a miracle and that she is made to praise Him. And she will shout to the Lord in a voice of triumph!! I end this post with a Scripture that I believe could be the very heart of the very prayer from Mahime – the girl named Praise. And it shall be my heart cry for her as well. It is 3 AM and I’m laying in my bed tossing and turning. Trying so hard to sleep and get myself back to a normal schedule. I keep telling myself that it’s just the jet lag, my body is still on African time, that I just need to force myself to sleep. But I know deep down inside that it is more than that. Something is haunting me, something is calling me to tell her story. My mind has not been able to escape the powerful words that I heard just a few days ago. Her words haunted me as she was telling them. I keep hearing the word undone in messages and conversations. A friend I made on the trip to Uganda used them in her writing. My wife used the word yesterday to describe how she is feeling. And it keeps reverberating in my mind, over and over… I feel as if I don’t write this down I may never sleep again. The only way I know to tell her story is to start from the beginning, but that isn’t really where the story starts for me. You have to understand who Lillian is today, who she has become in spite of all that had come against her. The woman standing before me telling us her story is a beautiful, vibrant African woman. So full of life and an effervescent energy. A smile and a laugh that I can only describe as a burst of sunshine. She laughed hard and loud and often. She spoke with the confidence of a queen, like royalty, like a diplomat. And she is all of those things to me and more. I met Lillian only ten days before, coming in from a red eye flight from Amsterdam. A flight that had already been delayed by four hours. We arrived so tired from our flight that all any of us wanted to do was to get to our hotel and sleep. We were running on empty but Lillian’s smile and her warm greeting seemed to energize us all a little. Even this early in the morning after flying all night, Lillian managed to make us laugh. Our burden seemed just a little bit lighter. I knew in an instant that I would enjoy Lillian. When I arrived at the bus, everyone had already boarded. I asked if she was Lillian and she said with the straightest face, “no I’m not”. And then the warmest laugh followed. She set me at ease so quickly and I knew from that moment that we would work together wonderfully the next ten days. Lillian loved to tease us. She took every opportunity to see how far she could make us believe a thing. Her statements were usually followed by a lightly accented “Is it not so?” Or “is it not true?” She would tell us with a straight face to do the oddest things and then immediately her infectious laugh would fill the air. 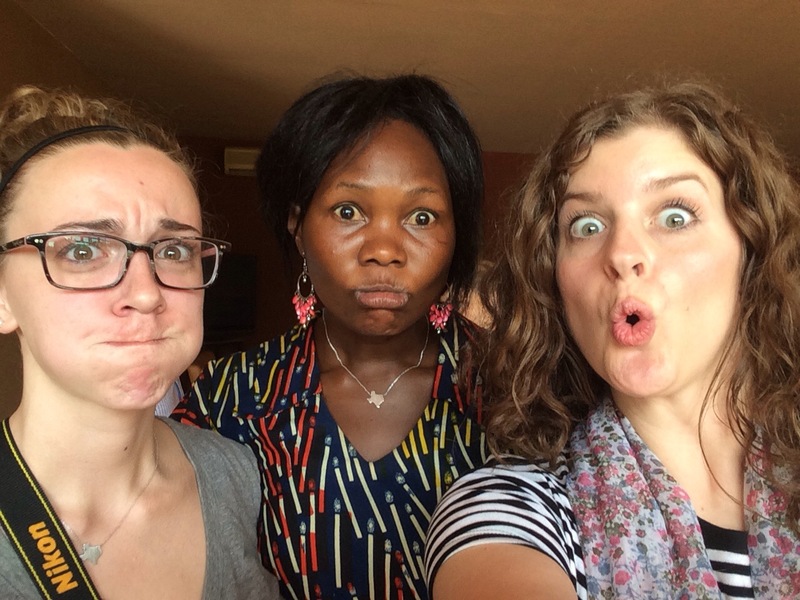 We spent the next ten days falling in love with this Ugandan princess, each and every one of us. It was our last morning of the trip and most of us knew that we had been walking on holy ground throughout our time in Uganda. So many times God had shared a sacred moment with us. Our emotions were raw by this point. We had cried many tears by now. We had laughed ourselves to tears too. We were coming to the end of a lifetime experience and most of us weren’t sure that we could let it go. I was at that place in a trip where I had come to love the people I was with and had served alongside. At that place where my heart had been wrecked once again. And also at that place that I was ready to be home, to be near family, to hold my wife in my arms. To share these experiences with her. What I wasn’t prepared for, was to have my heart ravished that morning by Lillian and by God. We have to go back now to a place that is very hard for Lillian to go to. A place that is so unlike where she is today. A place that no child, no person should ever have to go to or ever have to come from. We have to go back a few decades now to a time when Lillian was just a little girl. We have to go to a place where the struggles of life make love disappear. She was born into a family that already had too many mouths to feed. An unwanted baby girl and a burden for her mom and dad. A precious little child that was treated more like an unwanted piece of furniture than a creation of God. Maybe even worse, because she was told that she was worthless from a very early age. Her mother died when she was three months old and her father was killed just a few months later. Less than a year old and already made an orphan. She was shuffled amongst the many wives of her father. No one wanted her, no one could afford to care for her. After all, they had nothing to give their own children, let alone a child that did not belong to them. Lillian scratched and clawed her way through her early years. She became a servant to the women of her father’s family, a slave really; to her own half-sisters. She picked through the garbage to find anything she could eat. Some of the women that were supposed to be raising her took better care of their pigs than they did of her. Lillian would spend her days rummaging through trash and rubbish to find food for the pigs. When she found something that someone else had deemed unfit for consumption she would gather it for the pigs. The pieces that she could clean off and eat she kept for herself. And this is how she survived for many years. Granted less dignity than a common farm animal. Lillian fought to survive. She offered to work, to clean, to care for other unwanted children in the homes. And so they tolerated her existence. At the age of eight she found the slightest glimmer of hope. She found her way into a program at a local church. A safe place for her to go where she was given a hot meal and basic attention. A place where she learned that she had worth. A place that began to restore a little piece of dignity one tiny bite at a time. The only place she felt safe and loved. A place that took her away from the abuse and the threats and the deep hurt. Lillian began to love this magical place and the people that nurtured her. People that told her that she was valuable. It was here that she learned that God did love her after all. Love was a foreign language to her but she began to learn how to hear it and to speak it. Life was still very difficult for this little girl. She woke up early every day to chores that were handed out to her by stepsisters and half-sisters. The women that cursed her very existence. She managed to fall in love with learning and made school a priority in spite of the curses. She tried to never miss a class. Her mind was sharp and she was tenacious in her studies. She would dash off to school with a tired body but an excited spirit. Her heart was coming alive. She would have to hurry home to clean the house and prepare meals for the family. She gathered firewood and she gathered water but most of all she began to gather confidence. Lillian survived this way for a few more years, being kicked out of house after house. Never did anyone in the family see the slightest value in this hard-working, industrious girl. She suffered more disappointment when she would hurry to get to school only to be called out in front of the other children and told that her school fees were not paid and she would have to leave. Still the only bright spot continued to be the little Student Center at the little church in her village. No one ever told her that her fees were not paid here. Here she was loved and told that there was a purpose to her life. Here is where she received a sponsor that wrote her letters of encouragement. It was at this little project at a little church where she first knew that someone else in the world, whom she had never met, loved her. And so it would go like this for Lillian for a few more years. She was watching the pages of poverty open in her life, day after day. This was the story of her life. No family to love her, no one to care. Only hard work and disappointment every day. Her only morsel of hope coming from a stranger in a strange land. Lillian’s life became even more difficult when her uncle, the brother of her father passed away. Now the women had even less reason to care for her. She was thrown out of house after house at the tender age of 16. No one had any use for her, she was a burden. No one even knew who she belonged to anymore. She was living in a community without a soul. So now Lillian was a young woman of sixteen and now she was being told that she had to leave the only family she had ever known. People that abused her and mistreated her. People that despised her because she didn’t belong to anyone. She was told it was time to go, to find a man that would marry her, to go and find her parents because they had no use for her anymore. These were the children of her father that were now telling her to leave and to never come back. She admits that she wasn’t even sure if they were her father’s children because she had never seen her father. But these were the people that were supposed to care for her, to provide for her basic needs. So she picked up her meager belongings and left the home, wandering through the village. She had nowhere to go, nowhere to turn to. She slept on the street like a stray dog. What little clothes she owned she kept in a bag and hid it in the bushes. She wandered the streets at night looking for a place to lay her head. This was the point in her life that she began to hate. Hate for everyone. Hate for the people that were supposed to love her. There was no one that she could not hate at this moment in her life. She even hated God for allowing this to happen to her. All God was to her was someone that took from her. Someone that took her parents. Every year another member of her family was taken away from her, a brother or sister, an auntie or an uncle. She couldn’t even go to the Compassion Project to share her problems. She was determined that no one cared. For her, life had come to a standstill and no one cared what would become of her. Any remnant of security that she possessed had been violently torn from her. Shame now kept her from sharing her burdens with the only people that had ever shown love to her. When hunger would overcome her she would sneak to the project to get a bite of food. Now her life was not only void of hope but was now full of shame. She only wanted to die now. She found poison to take her life. She could only think of one way out of the misery that enveloped her. All she could hear is that she should drink the poison and die. There was no longer any use for her to be alive. So if she was to die now, her only remaining desire was that she would die happy. But as she looked around there was nothing that could ever make her happy. All she could see is despair. And then she realized that amongst her meager belongings were her sponsor’s letters. They had become a prized possession to her. And she began to read the letters one by one. This was the only time she had ever experienced joy, these letters were the one thing in her life that brought light into her darkness. They brought her joy. Lillian realized that as she read each letter the love of her sponsor was shining through. She also realized at this moment that her sponsor would not be happy if she found out Lillian had died. She could not bear the thought of making her sponsor sad. Her sponsor had taught her to pray, to persist, that God had prepared a crown for her. This dirty, scared little girl picked up her belongings and walked to the only place that had ever shown her any dignity. Lillian was welcomed into a new family that day. She was taught that day and for the rest of her life that every child has tremendous value and that no child would be lost at the project. She began to believe from that moment that she would not lose her life, she would not lose her future. She finally had someone to share her burdens. 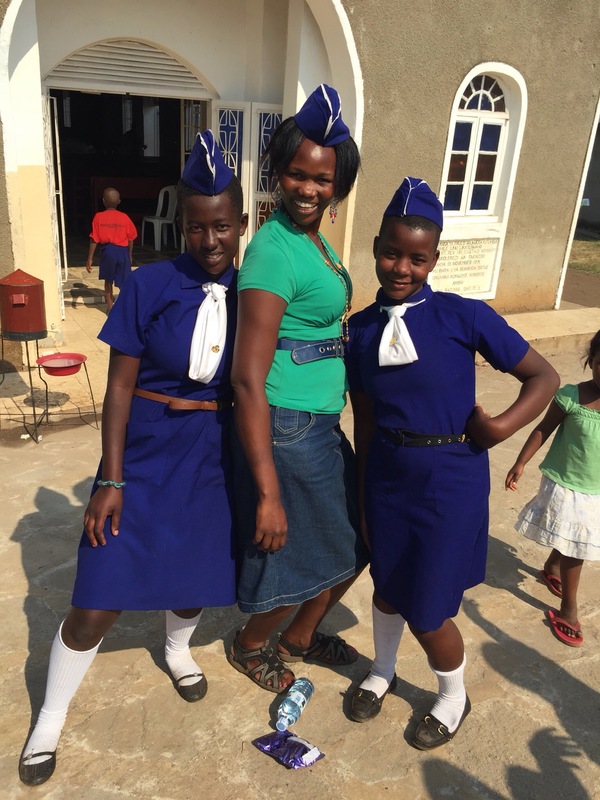 Lillian went on to finish high school and further her education. She attended university and received a degree in Communications. But her story does not end here. You see, those letters that were so treasured by a little girl were like seeds scattered in the garden of Lillian’s life. And in her own words those seeds grew into trees that brought shelter for her. She learned what it meant to humble yourself and serve others. She learned to understand the love that Christ has for her. She learned to love the God that at one time she had grown to hate. She could finally see that this God that she had accused of taking from her was actually giving to her. He was still taking from her, but He was taking away the things that He had never intended for her in the first place. He was taking away her pain and her despair. And now He was beginning to take away the bitterness that she had eaten all of her life. God helped Lillian to embrace the grace that she would need to forgive. To forgive those that had taken everything from her. To forgive those that did not deserve it. To be freed from the locks of her suffering she had to forgive all of the people that had hurt her. The message was clear…forgive, forgive your family, forgive everyone that has ever hurt you. And so Lillian did forgive. She wanted to show them what Christ had shown her. The family gathered at Lillian’s request, many of them afraid of what she might tell them. They carried the shame of putting her out, of using her and hating her. Lillian knew what it meant to be given another chance, what it meant to be transformed. She had to show this same grace to her family. This change in her is what she realized was happening in the lives of so many other sponsored children. In her words, “if you can see me, then you can see the future of another child”. Those little “seeds” of encouragement from the letters written by a woman in a faraway place to a dirty little girl living in a very dark place on another continent; have become a mighty oak of righteousness. That tree is now spreading it’s branches and providing cool shade from the harshest heat of the day. 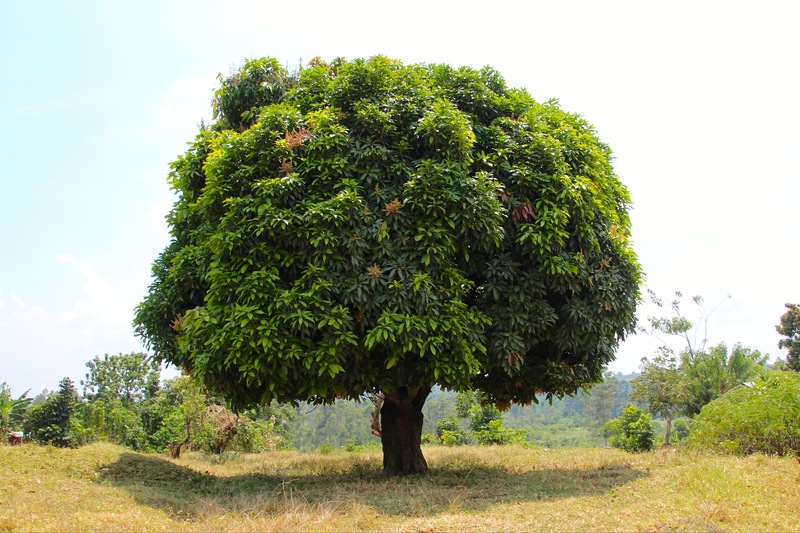 That tree is now providing rich fruit to give sustenance to those who need it. And we stood beneath that tree that day. A tree that we have found such beauty and refuge under. A tree named Lillian, whose faith is blinding, whose faith is radiant. We ended the morning in tears of course. And a beautiful soul shared from the Book of Psalms. and on His law she meditates day and night. Lillian telling everyone at our Child Visit Day that I was her sponsor and she was my child. Lillian and some of her newest friends. Lillian is the one in the middle in case you were wondering. Lillian with two girls from the Student Center also named Lillian. An inspiration to them I’m sure. I cannot shake the phrase…”broken places”. I keep hearing the words “the light can only shine through the broken places of the vessel”. It was just this morning that a dearly loved person sent me the picture posted here, and the words “another way of seeing beauty in the broken”. “Beauty in the broken”. 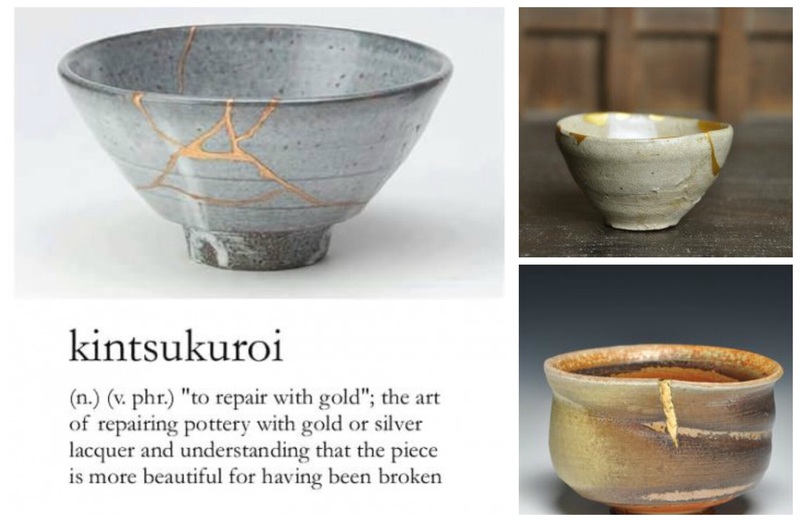 “The piece is more beautiful for having been broken”. Isn’t this what any great art does for us? It’s not just created to look beautiful. It is meant to make us feel something. The Japanese believe when something has suffered damage, it can become more beautiful than before. The signifigance of that object has increased. Those of us that have just returned from Uganda, that have had our hearts torn and our faith stretched; are we not better now from the experience? As others have asked, are we not broken but somehow better? Damaged but still significant? Incomplete and yet wonderful? Are we not feeling limited and yet filled with possibilities? Has not God taken our broken pieces of life, our shattered hearts and filled those cracks with gold? So the statement is – “We are the clay, and you are the potter. We all are formed by your hand” Isaiah 64:8 NLT. And then the question becomes – how do I allow you Lord to pour your gold into the cracks and the broken places? To know that I have been dropped and kicked and marred and broken, yet you still see that I am valuable. You see that I am of great worth and your intentions for me are to be used for your greater good. 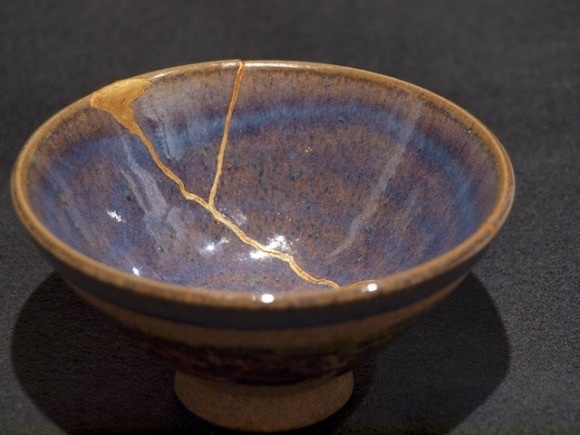 That you intend to take this cracked and broken vessel and repair it with the finest gold. Gold that has been through the Refiner’s fire and will make this seemingly useless and simple piece of clay gleam and sparkle. A vessel used by the King of all kings. Formed in your hand for a higher purpose. We have seen enough of the broken places to possibly last a lifetime. Perhaps there is more we need to see. Some of us have cried enough for a lifetime or have we even begun to really cry? We walked on their streets and visited their homes. We listened to their dreams. We encouraged them to hope. We held them in our arms and kissed them on their cheeks. We laughed with them, even when we thought there was so little to laugh about. But here the laughter was real. It was genuine in a way that laughter is not many times where we live. I can hear the difference. I can feel the difference. Their laughter went down into some deep place in my soul. I can still hear it when I take the time to listen. To borrow a phrase…when I become still enough to tremble. That is when I hear what is most important. It’s the sound of hope that is flowing through the cracked places. It is faint and then it is loud. And I don’t see the cracks any longer, I see the gold and it’s a vessel made whole. It has a higher purpose. “And see enough to know I’m blind”. It’s day two of being snowed in and I am completely bored with it. I am sick of looking at people’s pictures on FB of how much snow they got. I already know how much snow you got. I’m staring at it outside my window right this moment. Ok, I know you are posting pictures for people that don’t live here. Wanting them to feel one of two things. Either jealousy because they live somewhere where they never get to experience the wondrous joy of sledding or making snow angels. They don’t understand the feeling of creating a snow fort and tossing snowballs or making a giant snowman that looks like Frosty. However, today people are making snowmen that look like a fat Pharell Williams instead. Or they are super creative and are making snow dragons or super cool ice sculptures. The second reason that you are posting all of these “look how much snow I got at my house!” photos is because you want sympathy. Don’t you feel sorry for me because I’m snowed in and can’t do my daily run, or ride my bike or whatever else you want us to know you are missing. If truth be told, you probably wouldn’t be doing any of those things anyway. For me, I’m just bored. I’m tired of rummaging through the pantry and the refrigerator looking for comfort food. If you know my wife, this is a very hard task indeed. She doesn’t keep Oreos and potato chips in the house. “If they aren’t there you won’t want them”, she says all the time. It’s not true, I still want them. But thankfully I have to resort to more nutritious forms of comfort. Veggies and fruit. Good thing too. I would be enormous if she kept buckets of Chunky Monkey in the freezer. I saw a great video recently of someone coming home from work and parking in their snow-packed driveway. The snow was piled up for ten feet and he could barely make it to his front door. One of his kids (I’m guessing) had made the most adorable snowman in the front yard. A Frosty look-alike with the carrot nose and the cute scarf and adorable hat. As he walked past the snowman he swung his briefcase as hard as he could and knocked the head clear off the snowy creature. I laughed out loud. The caption was “anyone else getting sick of all this snow?” We can relate buddy. There is a good side to snowstorms, no really! For instance, I’m listening to my wife right now talking on the phone with her mom. They have been at it for over an hour now. Maybe two. I keep catching little bits of their conversation and little bits of laughter. They are talking about everything under the sun. It’s a good catch up talk. My wife knows she needs to call her mom more. She loves her mom very much but calling her requires a great deal of time. And when you aren’t snowed in there doesn’t seem to be enough time. Of course there is, but on snow days there seems to be a lot more of it. Another good side? For me I always make excuses not to write. I did everything I could over the past two days to avoid it. I read. And read some more. I caught up on all those silly videos that I have been saving on my phone. I read blog posts from friends and strangers. I attempted to shop on line. And realized I don’t need a thing. Not sure why I avoid writing. Once I start I enjoy it. And I hope the people reading this enjoy it. So back to snow day. Please don’t get me wrong. I don’t want you to walk away from this and think “man that guy is depressing!” It’s just that as an adult, snow for days, means shoveling the driveway, especially since my snow thrower wouldn’t start today. I was actually looking forward to using it. We finally have enough snow to justify me breaking out the machine and gloat at my neighbors that are stuck using shovels. It hasn’t been started in two years. And it wasn’t about to start now. Before you condemn me to the “crappy husband” category, she likes doing stuff like that. She wouldn’t give me the shovel. I asked, really I did. I didn’t keep asking. It’s kind of like when you offer to pay for something, a lunch or dinner, or offer someone gas money and they say no. I usually ask once more and if they say no, I’m off the hook. Don’t try this with me though. If you ask me a second time I will take your money. Snow for days also means having to drive in it eventually. I’m actually a good driver in the snow. I know not to lean on the brakes when you start to slide. I know to turn the wheel into the skid, the most non-instinctual thing about driving on ice and snow. It’s the other drivers that you have to contend with. Those people that don’t live here or are coming from those warm weather places that you have been trying to impress with your “look how deep the snow is here!” pictures. The ones that are stranded on the side of the road because they didn’t want to spring for snow tires. The ones that bought a four-wheel drive and think they can drive as fast as they please. And you can drive fast with a four-wheel drive. But at some point you will need to stop. Those are the ones that I pass by that are in the ditch with their front ends all twisted up. Or the ones that are having their vehicle towed to the shop for an alignment or new rims because they slammed into one too many curbs. But it’s not all frozen pipes and busted water mains. I was reminiscing about some of the snow storms I have lived through. Thinking about when I was a kid and we would take our sleds out at the first sign of the white stuff. I remember a place when I was around ten years old where the local fire department would run the fire hydrants for what seemed like days to make an ice skating rink. They would mark off one side for ice skaters and the other side for sledders. This worked out remarkably well until some of us boys got the great idea that if we got enough of a running start, we could play ice bowling with the less nimble skaters. We had those great old-fashioned sleds made of wood and steel, with handles on the front that you could actually use to steer if you applied enough pressure and leaned just right. So off we would go, running as fast as we could run. This wasn’t really all that easy. We were running on a sheet of ice after all. But we would get moving as fast as our feet could go and leap onto our sleds. Man, we would glide for what felt like miles. And we would steer for the kids that weren’t looking. If we got someone to fall we would shriek with laughter. Bowling for skaters. We’d wind up getting sued by the ACLU if we tried a stunt like that today. I thought about the time my dad took me and my brothers sledding in the forest. It was a big deal. This was no ordinary find a hill that we could walk to and have to share it with a thousand other kids outing. This was loading up a toboggan and those round metal discs into the back of the pickup truck and driving up to the mountains sledding. This was the real deal. This was living the scene from Christmas Vacation when Clark Griswold greased up the disc and headed down the mountain. We didn’t catch on fire but we had to dodge our fair share of trees. It took us a few runs to pack down the snow and create our makeshift bobsled run. We probably almost lost our lives several times that day but all I remember is dad took time off to take his kids sledding. And that’s a memory I still cherish. It brought a few tears just now thinking about that simpler time in my life. A time when nothing else mattered but getting in another run and hanging on for dear life. Well that and trying to stay warm. That was really the only reason that any of us would stop sledding. That was the only reason we would stop a game of bowling for skaters. That, and because someone’s mom or dad would come out and yell at us to stop hurting their kid or they were going to call the cops on us. So yes it’s cold outside and the snow is getting deeper. And I know you would rather have a snow day on a weekday. Who doesn’t like getting out of a day of work now and then? But take the time and read a good book, grab a hot chocolate, watch a good movie. Make a few phone calls. Snuggle with some of the people that you love. And if you’re feeling really ambitious, make a snow fort and have a good old-fashioned snowball fight. Make a snowman or a snow dragon. Or maybe take the kids sledding. They just might write about it some day and it just might bring a tear to their eyes too.